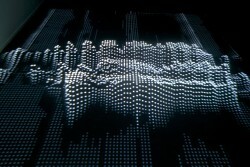 In Internet Topography, an immersive installation of sound and light, a sound signal in infra-bass is emitted from the site of the exhibit towards a server found in Tokyo. It is then instantly sent back to its place of origin, where it gets broadcast. In passing through different parts of the world, New York, London, Paris, etc., the signal undergoes multiple perturbations. 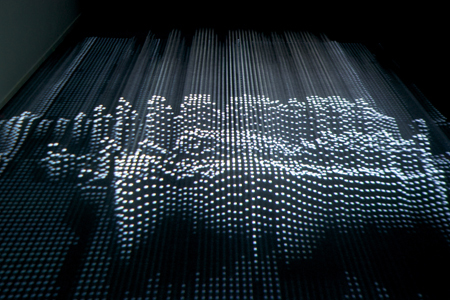 The audio transmission errors that result from this trajectory are usually automatically smoothed out by the functions inherent to the devices, but that the artists have deactivated here. The errors are kept, analyzed, then considered a potential and fragmentary reading of the topography of the network. The variations and alterations of this topography are made visible thanks to the digital sound continuously broadcast in space and in which we notice the hitches of the journey in unexpected bursts. This also thanks to a projection on the floor made of white lines composed of points of light that flutter beneath our feet as the signal encounters transmission errors. The lines are desynchronized, packets get lost, duplicate, drawing the imaginary contours of this new type of immaterial landscape in multiple troughs and crests. By putting the imperfections of the network in light, the artists put it on display with an entirely new kind of fragility, making the automatic processes almost living. In the imperfection, the surprise of the event is born; something is happening, here and now. Time and distance, usually annihilated by the speed of data transmission, are visible here. Art of Failure is a duo of artists named Nicolas Maigret and Nicolas Montgermont. 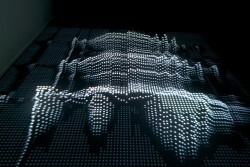 Their work is inspired by historical avant-gardes and artistic and scientific experiments. Through their different projects, they explore the ability of contemporary technologies to generate specific sonant or visual languages. In their works, the internal characteristics of media are made perceptible through their errors, malfunctions, borderline states or breaking points, from which they develop simultaneously sensory and immersive audiovisual experiments.